Beware the gruesome photographic qualities! So we bought WAY too many raspberries last Saturday. Many of them have found their way to the freezer, which seems a bit of a shame with such great fresh produce. But better that than let them go to waste. Coat chicken breasts with flour and saute in oil until nearly done. Transfer to plate. Deglaze the pan with broth (one use for my homemade veggie broth!). Add roughly a cup of raspberries and some thyme. Bring to a low boil and simmer for a few minutes, while crushing the berries. Strain the liquid to remove seeds. Return to the pan. Whisk together another 1/4 c. of broth and 1 tsp. cornstarch; then add that mixture to the pan. Bring to a boil, add a pinch of salt and maybe 1 T. of sugar – both just to taste. Finally, add lemon juice and 1 T. butter. I would also have added wine and/or vinegar at this point, but there is already red wine in my broth so I didn’t want to overdo it. Return the chicken to the pan to heat through and soak up the raspberry sauce. Spoon sauce over the chicken on the plate and garnish the dish with fresh raspberries. The chicken tasted great, if I do say so myself. However, it does pose a visual problem. Is it a tender chicken breast served in a luscious, warm red sauce? Or is it a disturbing, thickening pool of red liquid around an odd and brightly colored chicken breast? Weigh in by leaving a comment! PS Serve it with mashed potatoes and a side salad from CSA ingredients for an all around yummy meal! This entry was posted in General on July 14, 2011 by theneighborboys. It DOES sort of look like a flattened human heart with berries on top. Or maybe some sort of molded Jell-O dish. Sweet breads aside, I’m sure it was delicious! Well, I am glad that you clarified what it was in your post, or we may have been guessing….love Elyse’s comment! 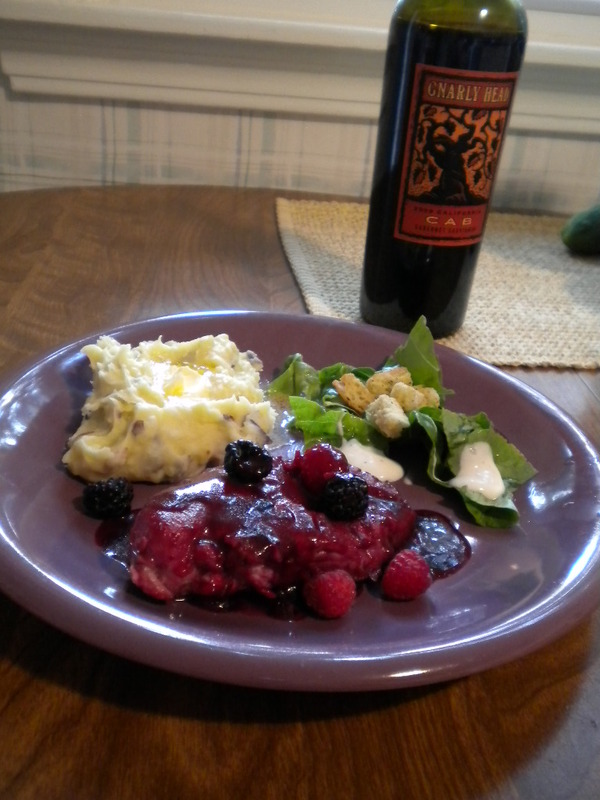 I LOVE raspberry chicken, especially served with mashed potatoes and a salad. Kim and I used to go to a restaurant in Green called Burkheart Brewing Company, and although I would pretend to look at the menu to get something different, I ordered the raspberry chicken with garlic mashed potatoes every single time! They just were not so generous with the sauce! The mistake was reheating the chicken in the sauce, because it just picked up the red color throughout. It makes it appear much saucier than it really was. Had I simply drizzled it over at the end, everything would have looked much better. Live and learn. Of course, if it weren’t for the blog, it would have been delicious and the appearance wouldn’t have mattered so much! It was one of the best meals I have had! It looks like it would be really sweet but not too much. Just the perfect amountf sweetness!